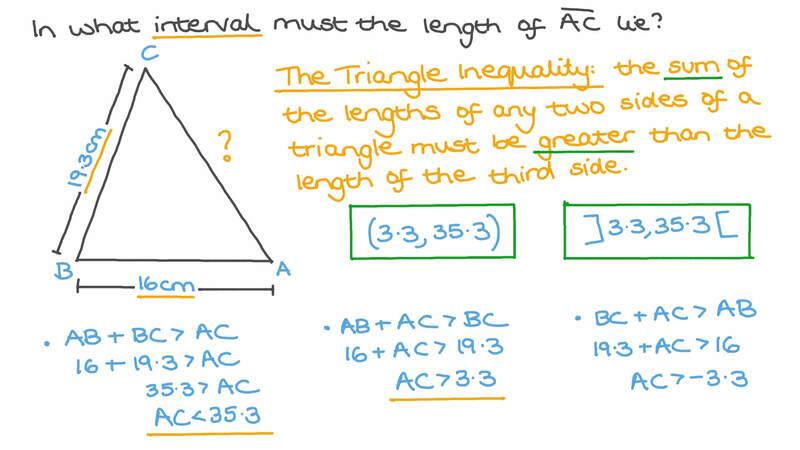 In this lesson, we will learn how to apply the triangle inequality to determine whether three given lengths can be sides of a triangle. In what interval must the length of lie? Complete the sentence: The sum of the lengths of any two sides in a triangle is the length of the other side. 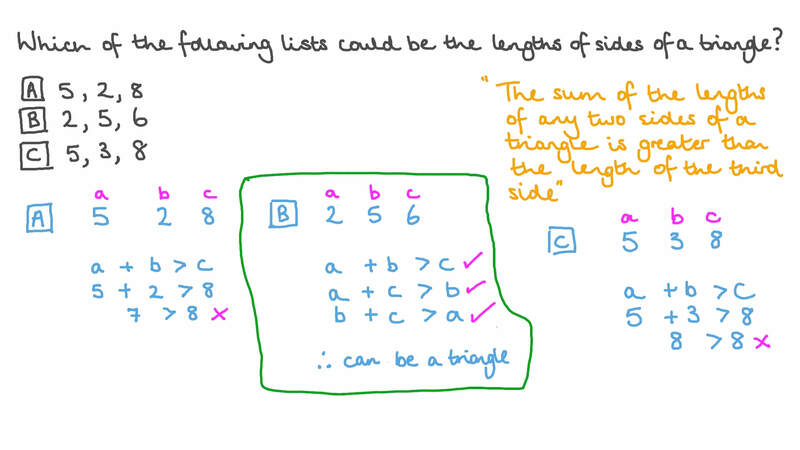 Which of the following lists could be the lengths of sides of a triangle? Which of the following lists of numbers is NOT the lengths of sides of a triangle? Two sides in a triangle have lengths 2.6 and 2.4. In what interval must the length of the third side be? Which of the following could be side lengths of a triangle? If the lengths of two sides of a triangle are 3 cm and 9 cm, determine the interval to which the length of the third side belongs. Is it possible to form a triangle with side lengths 6 m, 7 m, and 18 m? CThere is not enough information to tell. Is it possible to form a triangle with side lengths 3 inches, 5 inches, and 7 inches? Determine whether the following sentence is true or false: Knowing the measures of the angles of a triangle is enough to be able to draw that triangle. If the measures of two sides of a triangle are 3 cm and 20 cm, which of the following could NOT be the measure of the third side? Find the range of all possible values of 𝑥 if ( 𝑥 + 6 ) cm, 2 cm, and 25 cm represent the lengths of the sides of a triangle. Which of the following groups of lengths can form the sides of a triangle? Does the triangle with side lengths 8, 32, and 16 exist? Is the length of any side in a triangle less than, equal to or greater than the sum of the length of the other two sides? In triangle 𝐴 𝐵 𝐶 , is 𝐴 𝐵 + 𝐵 𝐶 − 𝐴 𝐶 < , = , > 0 o r ? Is it possible to draw a triangle with side lengths of 6 cm, 11 cm, and 9 cm? 𝐴 𝐵 𝐶 is a triangle where 𝐹 is the midpoint of 𝐵 𝐶 . Is 𝐴 𝐵 + 𝐴 𝐶 < , = , > 𝐴 𝐹 + 𝐵 𝐹 o r ? If the measures of two sides of a triangle are 5 feet and 12 feet, what is the least possible whole-number measure for the third side? If the two side lengths of a triangle are 19.2 cm and 13.3 cm, then the length of the third is between and . 𝐴 𝐵 𝐶 is a triangle where ( 𝐴 𝐵 ) > ( 𝐴 𝐶 ) + ( 𝐵 𝐶 )    , 𝐴 𝐵 = 2 9 c m , 𝐴 𝐶 = 2 2 . 2 c m ,  𝐴 𝐷 ⟂ ⃖     ⃗ 𝐵 𝐶 at the point 𝐷 , and 𝐴 𝐷 = 2 1 c m . Calculate the length of 𝐵 𝐶 . Write an inequality that describes all the values of 𝑥 such that a triangle with edge lengths ( 𝑥 + 8 ) cm, ( 𝑥 + 1 2 ) cm, and ( 𝑥 + 1 4 ) cm exists. A triangle has sides of lengths 5 cm, 8 cm, and 𝑥 cm. State the range of values that 𝑥 could take.